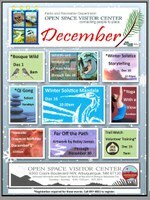 Join us at the Open Space Visitor Center this month for some exciting events! Saturday December 1, 10:00am – 12:00pm. Join artist Lynnette Rizek for a workshop using the art of “encaustics” (natural pigments mixed with hot wax) to decorate holiday ornaments. Limit 8 people. Please note that there is a $10.00 materials fee for the class, payable to the Open Space Alliance the day of the workshop. Space is limited. Please call 897-8831 to register. Sunday December 2, 8:00am – 10:00am. FREE! The Middle Rio Grande valley is nature’s laboratory with a different lesson plan every season. This is a moderately strenuous guided hike through one of the largest riverside-cottonwood forests in the world and along the banks of the Rio Grande. Please leave your pets at home. Space is limited. Please call 897-8831 to register. Sunday December 9, 2:00pm – 3:30pm. Circling Hands qigong is a qigong set where you stand in place doing a circle both with the hands and the body. The movements are designed to move fluids and Qi in the body which can help with the effects of aging and energizes the body. Instructor: Marcy Pincus. Class fee is a suggested $5.00 donation. A portion benefits the Open Space Alliance. Space is limited. Please call 897-8831 to register. Sunday December 16, 10:30am – 12:00pm. FREE! The Solstice Seed Mandala creation is an annual community art-making event to celebrate the coming of the winter season. At 11:30am, we will gather for the creation of a Mandala using different kinds of grains and seeds. The seeds of the mandala serve to feed migratory songbirds and the mandala remains in place for about a week. Participants contribute to the design and help to build the Mandala. A mandala is...an integrated structure; organized around a unifying center; Longchenpa. Call 897-8831 or see www.cabq.gov/openspace for more information. Sunday December 16, 12:30pm – 2:00pm. FREE! 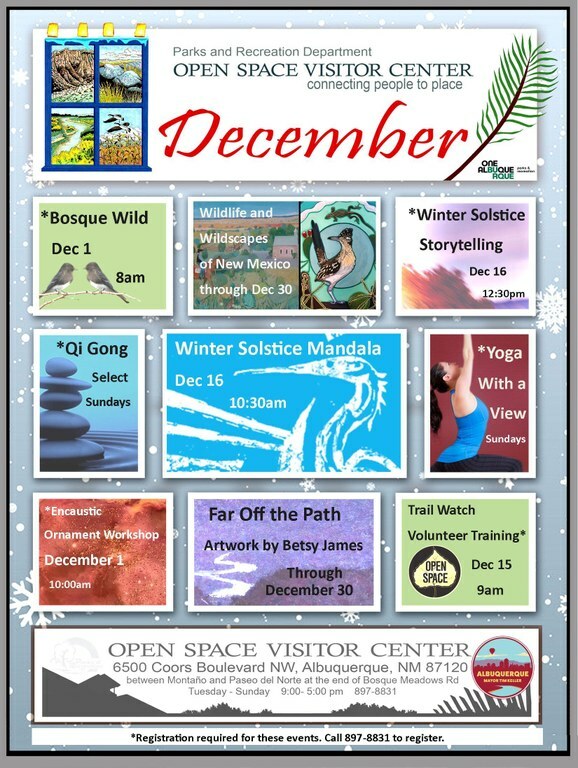 To celebrate the Winter Solstice, Regina Ress along with Scott and Johanna Hongell-Darsee bring winter tales and songs from around the world to the City of Albuquerque Open Space Visitor Center (OSVC). As we head toward the darkest time of the year, this hour of multi-cultural magic invites the light to return and with it a sweet new year. Call 897-8831 or see www.cabq.gov/openspace for more information. Sunday December 16, 2:00pm – 3:30pm. FREE! See event description for December 9. Space is limited. Please call 897-8831 to register. Saturday December 15, 9:00am – 12:30pm. FREE! Trail Watch Volunteers are the eyes and ears of the Open Space Division, reporting wildlife and visitor activities, maintenance needs, suspicious activity, and other vital information occurring on the 30,000 acres of diverse lands the Division manages. To register, contact Dionne Epps at [email protected] or call 897-8831. ONGOING through December 30. FREE! Experience this vibrant and magical exhibit through the month of December. L. Wren Walraven has received a BFA from Ohio University, and has worked in wildlife rehabilitation and bird surveying. She has been a professional artist for 19 years. Julia Cairns was born in Oxford, England in 1959. She paints at her studio in Galisteo, NM and takes part in the annual Studio Tour there every October. Julia teaches and travels, taking a group to Italy every year to paint the beautiful landscapes of Tuscany. Her inspiration comes from nature and the world around her. See www.cabq.gov/openspace or call 897-8831 for more details. ONGOING through December 30. FREE! The Open Space Visitor Center presents Far Off the Path, Watercolors and Words by Betsy James, through December 30. Betsy James is the author-illustrator of seventeen books for adults and children. Her latest novel, Roadsouls, was a finalist for the 2017 World Fantasy Award. She teaches at UNM Honors College, and lives in the North Valley. Please call 897-8831 or see www.cabq.gov/openspace for more information. ONGOING. Begin Sundays with an invigorating YOGA session at 9:00am. Your first class is $5, subsequent classes are $15, and if you buy in bulk, they’re even less. Class fees include a donation to the Open Space Alliance. Please call 897-8831 or see www.cabq.gov/openspace for more information. The Open Space Visitor Center is an interpretive hub for the Open Space program, lands, and resources. Visitors enjoy educational exhibits, art displays, wildlife fields, a Traditions garden, Bosque trails, and a variety of talks, workshops, demonstrations and entertainment. The Open Space Visitor Center is located at 6500 Coors Boulevard, between Montaño Road and Paseo del Norte at the end of Bosque Meadows Road. Look for the Flyway art installation. Call 505-897-8831 or see www.cabq.gov/openspace for more information.